As it’s the start of a new week, let’s begin with the dollar yen weekly chart and see what conclusions we can draw from looking at a longer time frame, and remember to use the long timescales for your direction, and the shorter time frames for your entry and exit points. In virtually all our trading we are either looking for confirmation signals of a move, or alternatively we are looking for turning points which may be signaling a change in direction. Looking at the chart in detail, there are two key points to consider. Firstly, following the trend between mid August and the end of December 2008, we are now in a period of weekly consolidation, which may be forming a bottom to the trend. 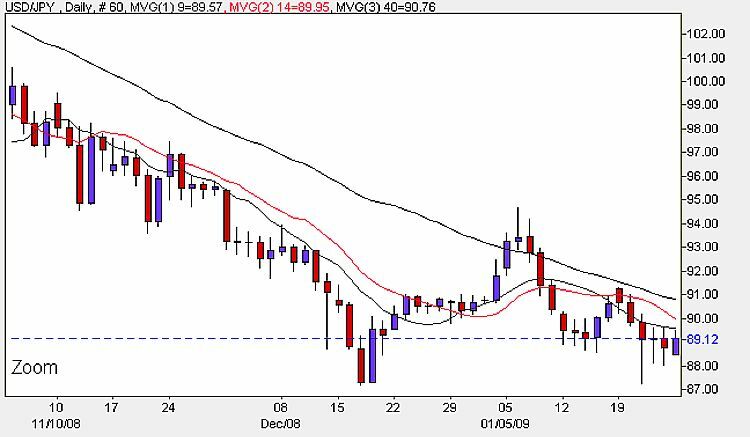 Last week’s candle however is bearish engulfing ( it engulfs the previous week within the body of the candle) indicating further price falls this week for the dollar yen currency pair, a move which may be confirmed by the moving averages which are all providing resistance to higher prices. Note also the failed breakout of two weeks earlier which bounced off the 14 day average. One has to remember however that the BOJ may intervene at any time to prevent further strength in the Japanese yen ( see below), so in any long term analysis we have to bear this in mind, particularly when trading in areas likely to raise concerns with the Bank of Japan! Now let’s look at the daily chart. 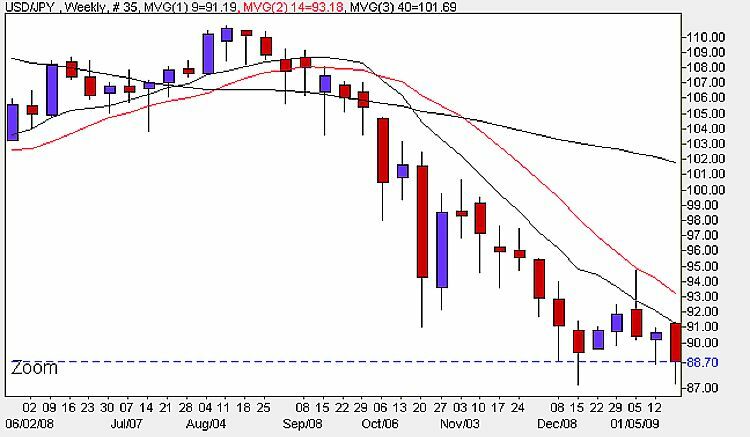 The dollar yen pair closed marginally lower on Friday, and on the daily chart we now have three consecutive doji candles, suggesting perhaps that the current support level is likely to provide a bounce in prices. This is an extremely difficult trade to forecast at the moment as the dollar yen pair have been trading in a very tight range for the last few days. Perhaps the most significant candle of the last week, was that of Wednesday 21st January, a deep hammer which would seem to suggest a possible move higher in the next few days. The immediate resistance area is around 89.50 and a break above this level could trigger a small bullish rise to the next resistance area at 90.70. Both the 9 day and 14 day moving averages have now crossed, with the currency pair moving well below the 40 day moving average. As I am sure you know, Japan is particularly vulnerable to currency fluctuations since its economy depends so heavily on exports for growth, and as a result the central Bank of Japan is one of the most interventionist anywhere in the world. In simple terms a weaker dollar makes Japanese companies’ products more expensive overseas, while reducing the value of their dollar-based earnings when converted into yen. Following the bubble economy the yen declined sharply, reaching a low of 134 yen to dollar in February 2002. The Bank of Japan’s policy of zero interest rates discouraged yen investments whilst simultaneously encouraging speculators in the currency markets with the carry trade, borrowing yen and investing in better paying currencies. This further devalued the yen and as recently as 2007, it was generally agreed that the yen was 15% undervalued against the US dollar and possibly as much as 40% against the Euro. The talk today is whether the BOJ will intervene and if so at what level, with the $87 area possibly being the point at which they would take action, which is perhaps one reason we saw the hammer on Wednesday last week, as prices briefly breached this level. Over the last few months we have seen a significant appreciation in the Japanese Yen to the point where the central bank cannot continue to ignore it and stand back, having risen more than 40% against the UK pound and both the Australian and New Zealand dollar. Despite assurances to the contrary, it is my belief that the BOJ can, and will intervene – they cannot afford to watch their economy enter another long period of sustained recession and I believe that the yen to dollar rate will rebound, possibly to around the 96.00 level in the short term to medium term. The only news out today is the Monetary Policy Meeting minutes, released late this evening UK time. The minutes provide a detailed insight into the economic conditions that influenced the Banks decision on interest rates, with a more hawkish tone generally good for the currency. I will advise on the minutes in tomorrow’s post. The short term trend is bearish, with medium term sideways and long term bullish.